Francis Peters graduated from Alliance High School in 1937. At the age of 18 he became a lifeguard working at area pools. He is credited with saving eight people from drowning while working as a lifeguard. He also became involved with programs to teach people to swim. Mr. Peters served the city of Alliance as Water Safety Chairman for 35 years and it is estimated, over that period of time, he taught more than 1,000 people to swim. In 1954, following the polio epidemic, he encountered a seven year old girl who was recovering from polio. Mr. Peters, in conjunction with the Y.M.C.A., developed a handicap swim program and the therapy to aid polio victims to gain movement in their limbs. At St. John’s Villa in Carrollton, Ohio, Mr. Peters taught the nuns techniques so that mentally handicapped children could safely use the pool at St. John’s. Francis Peters at his Alliance Red Cross office in 1964 planning a Learn to Swim Campaign. 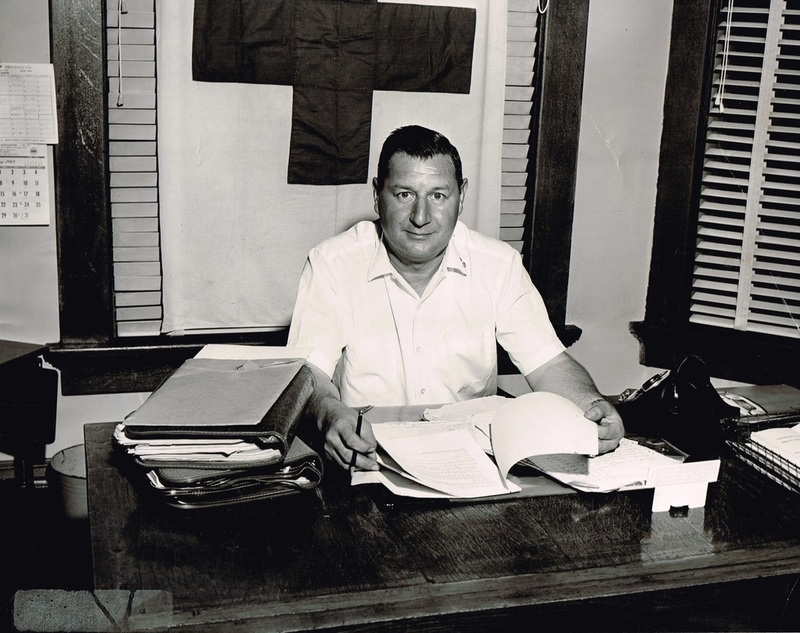 While associated with the Red Cross, Mr. Peters served as Dean of Aquatics for Stark County Boy Scouts of America. He received the Clara Barton Award from the American Red Cross for 50 years of service and for donating over 100 pints of blood. In 1985, Mr. Peters received a letter of appreciation from State Senator Scott Oelslager recognizing his lifelong commitment and outstanding services. During World War II Mr. Peters served in the U.S. Navy as a gunner’s mate third class aboard the Fletcher-class destroyer U.S.S. Marshall. He took part in the invasions of Okinawa and Iwo Jima and the rescue of over 3,000 crewmen from the U.S.S. Franklin, an aircraft carrier bombed by Japanese aircraft. He received the American Campaign Medal, the Victory Medal, the Philippine Liberation Medal and the Asiatic-Pacific Medal with two battle stars for his service in World War II. Francis and Constance Peters at their 74th anniversary celebration in 2015. Mr. Peters retired from the Ford Motor Company in 1987. He also worked for General Motors and Babcock & Wilcox. Biographical update: Francis Peters and his high school sweetheart Constance Dordea ’39 were married on May 17, 1941. They have lived most of their married years in the same house on West High Street in Alliance where they raised seven children who also graduated from AHS: Gary ’60, David ’63, Connie ’65, Christy ’66, Nikki ’73, Mark ‘80 and Jeff ‘82. Francis passed away on January 13, 2016 at age 97. Burial with full military honors was at Highland Memorial Park east of Alliance. He is survived by Constance, seven children, 16 grandchildren and nine great-grandchildren. Francis Peters, gunner's mate, U.S.S. Marshall, 1944.